Back on December 5, 2014 it was reported on Reuters that, "The Deb Shops retail chain filed its second bankruptcy in less than four years on Thursday and said it may conduct a going-out-of-business sale at its 295 stores that specialize in teen and young women's fashion, according to court documents." Philadelphia-based Deb Shops operates in 44 states, primarily along the East Coast and in the Midwest. The company employs 4,000 full-time and part-time employees, according to court documents. It appears that the overstuffed niche of apparel retailers targeting young people continues to see a shakeout. Deb Shops is certainly not the only teen retail store in financial trouble or going out of business recently. 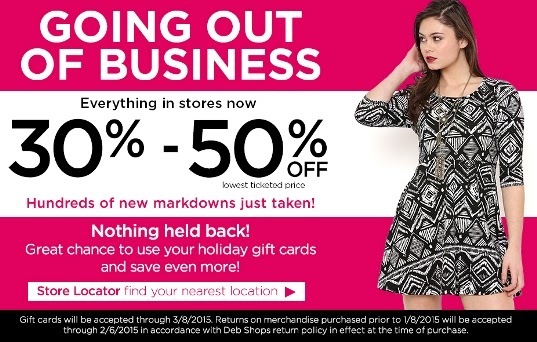 As of January 9, 2015 the Deb Shops retail locations began their "going-out-of-business-sales". According to their website today (January 27, 2015), Gift cards will be accepted through 3/8/2015. Returns on merchandise purchased prior to 1/8/2015 will be accepted through 2/6/2015 in accordance with Deb Shops return policy in effect at the time of purchase. The Going Out of Business Sale currently states that everything in the stores now 30% to 50% off the lowest ticketed price. Sad time for Deb Shops, but possibly a good purchasing opportunity for you.